Earn $2.05 in Rewards credit (205 points) What's This? 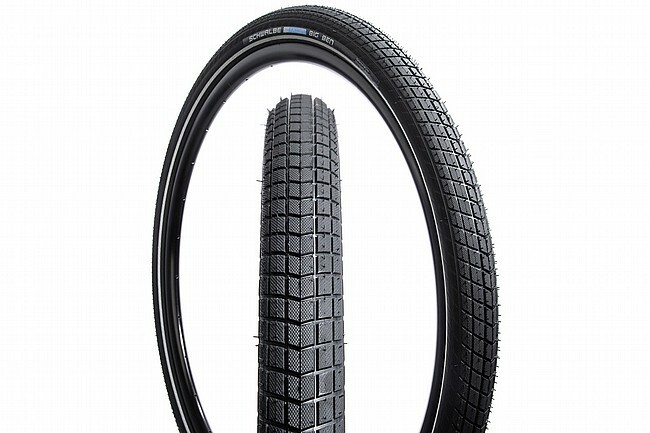 Smooth out those back-alley cobbles with the Schwalbe Big Ben E-Bike Tire. If it looks familiar to you, that's because it was designed as a chunkier version of Schwalbe's Big Apple, but this one can handle a little mixed terrain as well as being certified for the increased loads of E-bike motors. Its large volume soaks up bumps for a comfy ride wherever you are, and flats are prevented with a RaceGuard puncture protection belt under the tread. Features a reflective sidewall for increased visibility from the side. 26" x 2.15". 67 EPI casing. Wire bead. Claimed weight is 760 g.
The Big Ben by Schwalbe turned out to be an exceptional tire. I was concerned they would be heavier than the Kendas they replaced, but the Big Ben have that very pliable (thin wall) sidewall and they are not heavy at all (though that's a subjective statement), you can find the specs online. The rolling resistance is low, they are quiet. Even though they are described as 'chunkier' and a 'cruzer' type of tire, they are slightly narrower than my WTB Weirwolf 2.1 mountain bike tires (probably because the knobbies stick out on the WTB's). Meaning they don't appear bulky for this type of tire. I ride on rail-to-trail, blacktop bike paths and concrete but occasionally have to traverse some dirt paths. If you use them as intended, they are great tires. I'm considering getting an extra pair to store for later. I have these on my Stromer ST1. I have had pretty good luck with them. One set now has 2300 miles behind it, not a single puncture. They can handle a heavy loadIve carried a total load of 300 lbs. on rough city streets as well as bike trails and they are very (not totally) puncture proof. I hit a patch of glass shards and got a flat. I also had one with a sidewall split after 100 miles. They do grip and handle well.